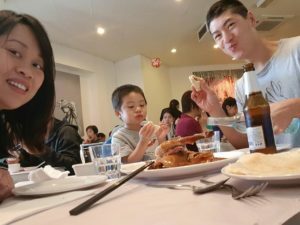 A couple of weeks ago we went to this Peking Duck restaurant in the city, apparently it’s a franchise in China, and this was the first branch in Australia. I’ve seen this place a few times as we drove to Queen St a fair bit to park the car when visiting the CBD, but never knew that it was actually a duck restaurant. It’s quite a large space, well, it’s like a two level place but they’ve removed the second floor so it just has a really high ceiling. The setting is nice and the service more upscale than your regular duck restaurant (i.e. Old Kingdom or Simon’s) but it’s not fine dining. We were six people and ordered two ducks and some fried rice (as two had already eaten something), whereas normally you’d order one duck between two (if it was done three ways), this was supposedly duck done two ways, but we did not get the duck soup (apparently all of the duck bones were bagged for take away by our Chinese speaking companions). The plum sauce, cucumber, and spring onions were individually portioned and more than enough for each of us. The duck however, was sliced a bit too thinly and at that point it is not clear how many slices you should put into your own crepe. I started off with two slices, but then we had leftover duck so I upped it to three slices of duck to each pancake, so in the end it seemed like two bigger slices or three smaller slices per crepe was right, whereas at Simon’s it might just be one slice or two smaller slices to a crepe. The duck itself was pretty good but the skin lacked the crispness that we’ve enjoyed at Old Kingdom and Simon’s, there was a side dish of fried duck fat which was a novelty. Dip it in a bit of sugar and you have quite the treat, but really, this duck meal was left a bit wanting (the fried rice wasn’t anything to write home about either), it was also about $15 bucks more expensive (78$) than Old Kingdom or Simon’s so that was definitely a thumbs down. On a side note worth noting, there was no need to pre-order the duck as is usually the case at Simon’s and Old Kingdom. We had some friends over from Adelaide on the weekend and as is our custom, we tried to wow them with something that they might not have tried in Adelaide (or might not even have). We weren’t able to get a preferred time slot (with our kids) so we had to settle with Hoi’s in Camberwell (near our work), we weren’t too sure about it as it’s usually just a take away/quick and dirty lunch place, that has re-branded in the past year or two as a Peking Duck restaurant. But it was our only option on short notice, we ordered two ducks over the phone (for five adults), but we were actually all still quite full from lunch, and then one of the adults dropped out. 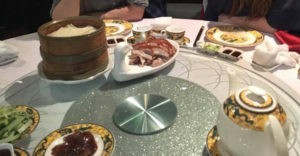 We managed to order duck three ways here, so the regular Peking duck with crepes, stir-fry duck bone (really it’s other pieces of duck that have meat on the bone), and some duck fried rice, there are also options of duck and tofu soup, and crispy noodles with duck among others. So they provide a few extra options over the other duck restaurants. The duck was sliced better here and the skin was crispier, there were also a couple of drumsticks on a plate that I happily chomped down, yes, the duck was much better here. They did however, skimp on the sauce and vegies, and when we asked for a sauce re-fill the waiter was very stingy and only half-filled the dish. We ended up only getting one duck which was probably a good thing because we weren’t hungry enough to take a second (we didn’t bother asking about it), even if we took it with us. So food, quite good, service horrible (not to mention my toddler was messing around on his high chair and the tray collapsed sending him sprawling on the floor!) but not unexpected, at 76$ for everything including a couple of beers and tea, the value was better than Quanjude. But I’d rate it lower than Old Kingdom and Simon’s for quality of food, but they are trying, and giving the extra options (something like six or seven total) is definitely a positive. So, next time our friends come over we’ll either have to take them to Simon’s or work out something else to wow them with, we’ll probably have six months to a year :D.